THERE is quiche Lorraine, and then there is bacon-and-egg pie. Despite the obvious similarities in ingredients (eggs, bacon, pastry crust), the two are not at all the same. Quiche Lorraine is open-faced and creamy, involving a smooth custard lightly speckled with bits of meaty French bacon. It is refined enough to serve at elegant luncheons, and delicate enough to have, at one dark point in the 1980s, caused some quiche-eaters to question their masculinity. 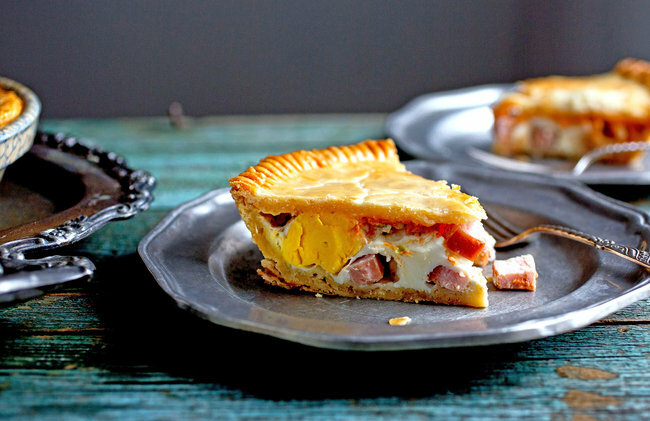 Not so bacon-and-egg pie, a rustic specialty from New Zealand. Made from whole eggs that hard-cook under a pastry crust lid and fat chunks of bacon, it is closer in feeling to steak-and-kidney pie, that sturdy pub staple, than to any French confection. You can eat slices with your hands, sandwich-style, while rooting for the All Blacks (the national rugby team). There are several reasons not to try this with a slice of quiche. The downside to the solidity of bacon-and-egg pie is that it can veer into leaden territory. You want the crust to be thick enough to hold the filling together, but not so thick that you need a cleaver to cut through it when your teeth should do fine. Using plenty of fat in the crust (either butter, shortening or lard) is mandatory to avoid toughness. Another potential pitfall is dry eggs or squishy pastry. If you cook the pie just long enough to set the eggs (25 minutes or so), you run the risk of not baking the pastry through. But if you cook it enough to fully bake the crust (45 minutes to an hour), your eggs can toughen. An easy fix is to pre-bake the bottom crust, then roll the top crust quite thin so it can bake quickly. A word about the bacon. You can use regular American bacon if you’d like, but you will need to brown it first. For this recipe, I chose Canadian bacon, which is leaner and more ham like, and does not need any advance prep. It’s closer to the kind of bacon used in New Zealand. Cubed ham works well, too. Vegetarians can leave out the meat and grate on some strong cheese. The usual bacon-and-egg pie seasoning, other than salt and pepper, is Wattie’s tomato sauce or ketchup. I spiked mine with chili-laden sriracha sauce. It works perfectly with the forthright flavors. And I love a little sriracha in everything. Even quiche.